Banana Bread Muffins are so easy to make! This recipe is my favorite banana bread recipe made into banana nut muffins, perfect for breakfast or brunch! I love making muffins on a weekly basis. They’re perfect for grab and go and throwing into lunch boxes. We even love them for snack! 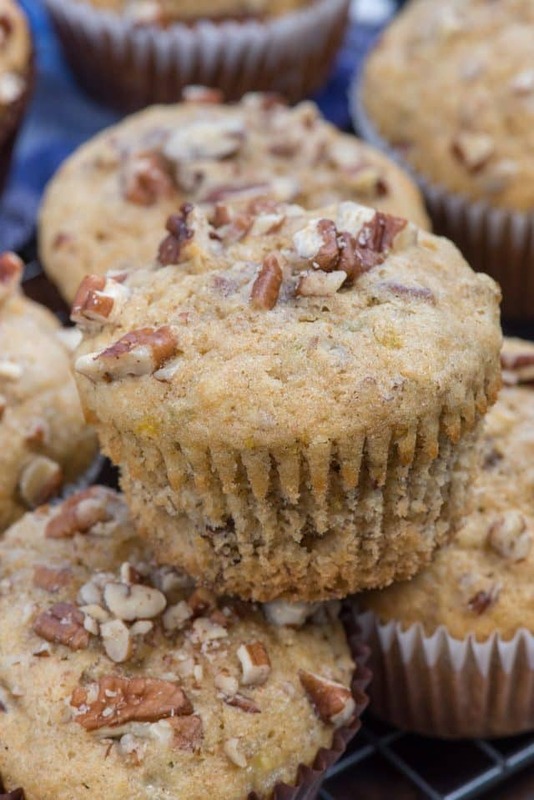 Plus, this muffin recipe comes from my favorite mom’s banana bread recipe which is one of the most popular on this site! Banana bread is one of those things that reminds me of childhood. Just the smell brings back memories of Saturday mornings with my mom and dad, waiting impatiently for the bread to come out of the oven. Banana bread takes so long to bake, after all, and then you have to wait at least a few minutes for it to cool so you don’t burn your mouth. That’s why making banana bread muffins is such a great idea: all the flavor and texture of banana bread but in a muffin form. Muffins cook faster, cool faster, and are easier to eat! In fact, I started this recipe by simply using my mom’s banana bread. I’ve been making muffins out of that bread for years and never thought to post it, until now. Add this recipe to your recipe box because everyone loves them and they come out perfect every time. 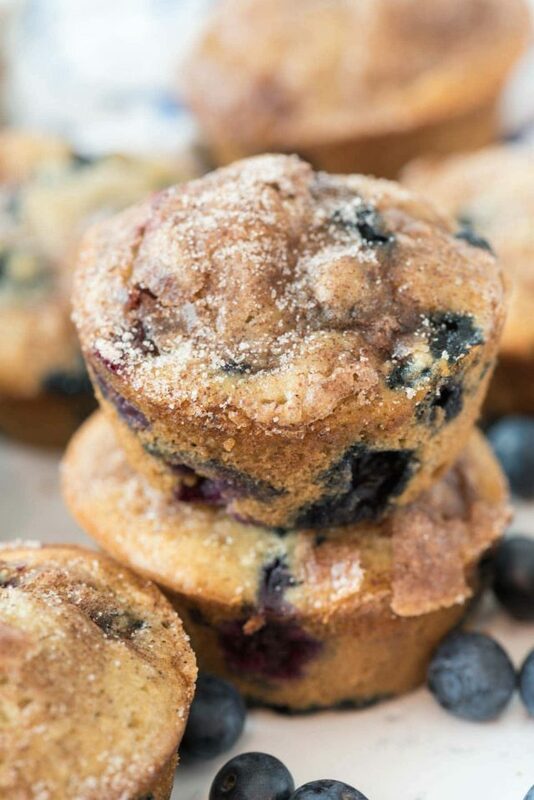 I’ve made banana muffins stuffed with cream cheese, and I’ve made them with blueberries, but these are a simple and easy banana nut muffin that every person should have in their muffin vault. I have to say, resisting muffins, especially banana muffins, is so hard for me. They’re just so easy to unwrap and eat! I also learned, after I made these, to hide them from Abby. Turns out she loves muffins – a lot. Jordan had one and left it in her room and Abby managed to find it and strew crumbs all over the floor. So…these are also doggy approved! I don’t know about you, but I always have overripe bananas either on my counter or in my freezer. Yes, freezer! Did you know that you can FREEZE old bananas? I do that all the time. Whenever I only buy a couple bananas we eat them all fast, but when I think to buy extra we end up eating none. There’s no way I can bake with 4 or 5 old bananas at once, so I pop them in the freezer until I’m ready for them. To use, just defrost on a plate. They get kind of gross looking and gooey, but they work just fine. Something funny I learned when I started blogging: my mom and I were the only ones who call them “tired” bananas. The first time I called for that in a recipe I got so many questions! We always referred to overripe bananas as “tired”…as in “old”, I guess. 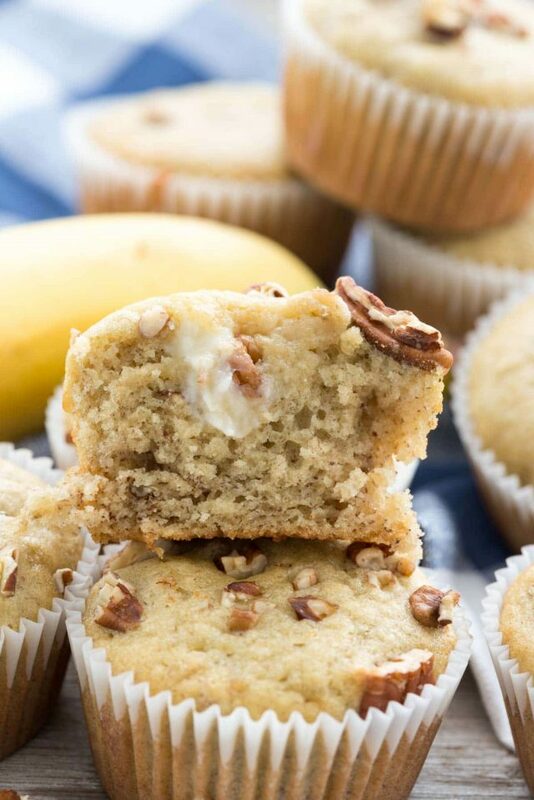 Whatever you call an old banana, they’re perfect to make banana bread muffins with! 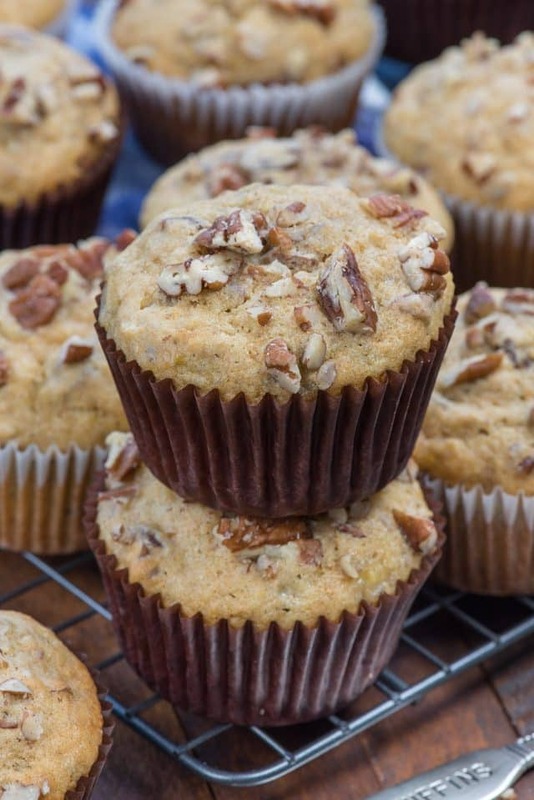 Banana Bread Muffins are an easy muffin recipe full of bananas and nuts. We love them for snacks or from the freezer for an easy breakfast. This banana muffin recipe is made with two bananas. If you want to use more, it requires adjusting other ingredients. The recipe calls for vegetable oil, making them a fast and easy one-bowl recipe. You can also use melted butter or coconut oil, or use softened butter and use a mixer to cream it with the sugar. You’ll notice the recipe calls for sour milk; that’s why my mom always called it. Basically, you can use buttermilk or you can make your own sour milk by adding vinegar to the milk. See the recipe for instructions. I’ve also used almond milk and just added 1 teaspoon of vinegar to the recipe, to activate the baking soda. Want to make chocolate chip banana bread muffins? Just add 1 cup of chocolate chips to the batter instead of the nuts. These freeze extremely well and are perfect for on the go snacks or breakfast, or for brunch! Want even more? Subscribe to Crazy for Crust to get new recipes and a newsletter delivered to your inbox. And stay in touch on Facebook, Pinterest, Twitter, and Instagram for all my latest updates. Preheat oven to 350°F. Line muffin pans with liners or spray with nonstick cooking spray. Mash bananas with a fork or potato masher until smooth. Stir together granulated sugar and oil. Add mashed bananas, eggs, sour milk, salt, and baking soda and stir until combined. Mixture will be slightly lumpy. Add flour and stir until just incorporated. Stir in 1/2 cup chopped nuts. Divide evenly among muffin liners, filling about 2/3 full. Sprinkle each muffin with some of the remaining nuts. Bake for 13-15 minutes until a toothpick comes out with just a few crumbs. These are wonderful fresh from the oven or cooled to room temperature. Store in an airtight container for up to 2 days or freeze for up to one month. Defrost at room temperature or in the microwave. If you love muffins be sure to check out my list of muffin recipes which includes all my favorites! 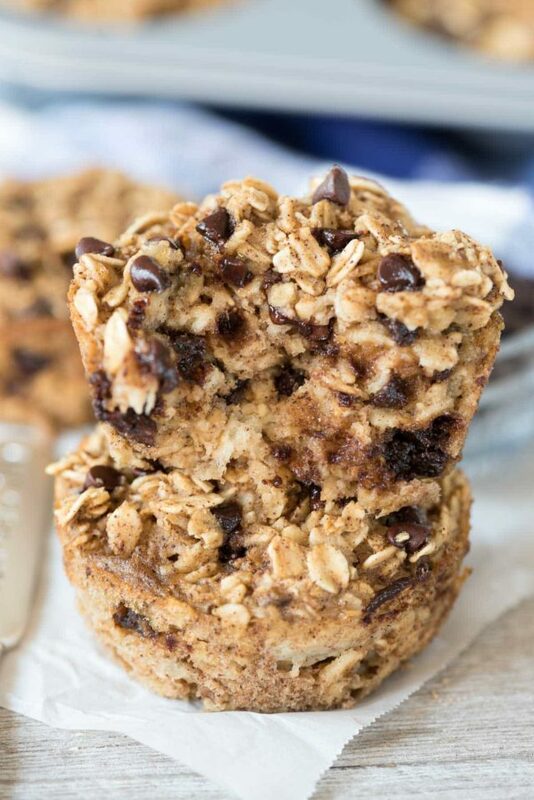 I love muffins and can’t wait to try these Chunky Monkey Banana Muffins with a streusel topping! Or what about muffins made with zucchini or blueberries?! I haven’t make the recipe yet but it sounds and looks great. I’m baking for groups so much I find I’m hesitant to add nuts worrying about nut-haters or allergies. A trick I’ve found is using roasted cacao nibs. Me, I haven’t met any nut I don’t love but you might consider that option next experiment. I made a banana bread not long ago with those added and got rave reviews. But I’d go with the nits f I knew people like those. Banana bread and nuts work well together. I had never heard anyone call overripe bananas tired until you did, but I immediately thought that it was the perfect and more polite way of calling them old and brown 🙂 I love banana bread and would adore these! Yum, the perfect afterschool/work snack, warmed up with a slather o’ buttah!